Cellar master Al Snape monitors the progress of a batch of hard cider made in Salem by Far From the Tree. “It’s crazy. You only need 51 percent juice in mass-market ciders,” Snape said with a shake of his head. Far From The Tree will be selling cider through the summer at farmers markets in Salem, Newburyport, and — first up on Monday — in Cambridge at the Central Square Farmers Market. The rollout over the next few weeks will also include some bars and restaurants in Salem and other North Shore communities, where the cider will be poured from small casks. A launch party is scheduled for June 7 at Lappin Park in Salem. Some tasting notes: Roots cider, intended to be Far From the Tree’s mainstay, is a dry, gently carbonated drink, pale yellow in color, that comes in just under 7 percent alcohol (equivalent to a robust beer) with surprisingly subtle fruit flavor. Sprig, a summer cider, boosts the apples and yeast with last-minute additions of Cascade hops from Four Star Farms in Northfield, and three flavors of mint (lemon, pineapple, and apple) from the Herb Farmacy in Salisbury. The light, bright, intricate flavors combine to make something special. “It’s going to be awesome on a hot day,” said Snape. “It was one of our experiments that ended up so well, we ended up bottling 400 bottles of it,” said Denise Snape. The ciders will be sold in bottles that hold 500 milliliters (about 17 ounces) and are expected to retail for $9 or $10. The partners also hope to have a tasting room at their leased facility just south of downtown, but for now there is just a wood-plank bar, a few glasses, and the “barrel thief,” used to siphon tasting samples. The location is a former slaughterhouse and food distribution center. The room where they keep the barrels is a former walk-in cooler that provides enough insulation to keep the cider from warming too much even though the refrigeration equipment has been removed. They have 90 wooden barrels, each filled with 53 gallons of various batches of cider that Al Snape will blend to make Roots and their other lines. 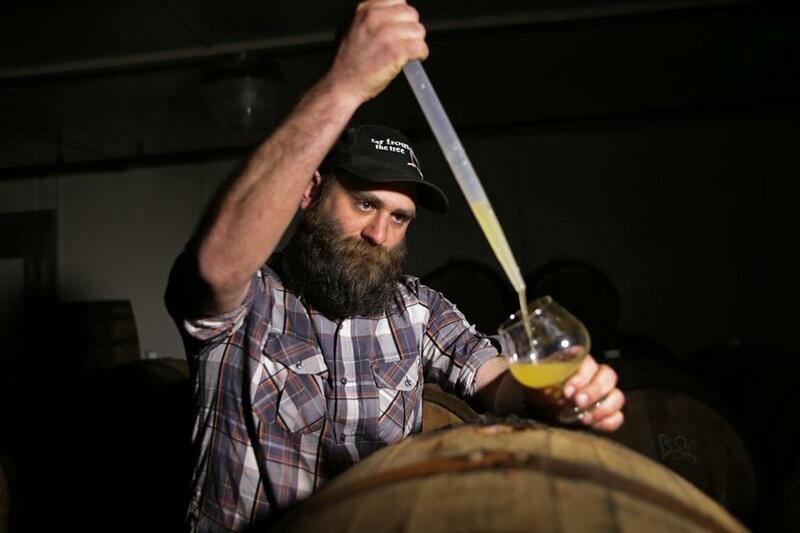 He said he is hoping to keep some of it around for months or even years of barrel aging, allowing the cider to take on flavor from the used bourbon barrels. That will allow him to blend more interesting ciders. He gestures to his wife and Needham: “I’m going to be holding onto it as much as I can and they’re going to be trying to sell it,” he said. They have old books telling how cider was made in New England 250 years ago, and they are hewing pretty close to the same method. Apples from orchards in Central Massachusetts are taken to Stow for pressing at Box Mill Farm. The juice is returned to Salem and pumped into the barrels with a touch of saison or another kind of yeast. The first fermentation process converts the sugar from the apples into alcohol and carbon dioxide; a second fermentation is fueled by a small amount of maple syrup from Country Maple Farms in Shelburne. Some barrels get a third step, using bacteria to convert malic acid to lactic acid in the cider, adding fruitier, creamier notes. Blending barrels that have had this fermentation with others that have not allows Snape more ways to adjust the final product. The carbon dioxide escapes from the cider during months of barrel fermentation, leaving it basically flat. When the cider is bottled, a few drops of maple syrup and a touch of Champagne yeast are added for an in-bottle fermentation that provides carbonation. After a few weeks, the cider is ready to be sold. Every extra component means more steps, which may be one reason they do not add much. For the Sprig, hops were added to the barrels two weeks and the mint two days before bottling. Both were then strained by pouring the cider through a funnel full of hops. Denise Snape is from Pennsylvania and specializes in project management; the other three are Massachusetts natives who met while still in school. Al Snape worked in radioactive and hazardous waste storage, while Needham worked in a molecular biology lab. Fitzpatrick, the only one who is keeping his day job, works in the financial industry. The Snapes live in Salem, Needham in Essex, and Fitzpatrick in Quincy. The Snapes made beer and wine at home and decided to make their hobby their work. They moved to England for three years, where Al obtained a degree in oenology (wine-making) and viticulture (the study of grape cultivation) from the University of Brighton. They became interested in English ciders, which they found to be dry, light, and refreshing. “You go to a bar with 30 people, and five or ten are drinking cider,” Al Snape said. They also spent some time in Europe, working at wineries and living the life. “Our best experiences over there were from people drinking wine that represented who they were and where they were from, so we said, ‘Let’s go back to Massachusetts and see what we can do,’ ” Snape said.